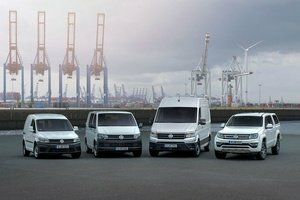 Volkswagen Commercial Vehicles (VWCV) has delivered in the first two months of the year 75,000 vehicles worldwide. This was 8,900 vehicles more than in the same period last year (+13.4 per cent). The largest sales region was Western Europe. Here, with 50,600 vehicle deliveries, an increase of 19.8 per cent was achieved. With 7,700 vehicle deliveries (+38.8 per cent) between January and February, the markets in Eastern Europe also made a significant contribution to the brand’s rising sales volume. In Mexico (North American market) and the South American markets, 7,700 vehicles were delivered, 1,200 fewer than in the same period of the previous year (‑13.6 per cent). At 4,100 vehicles, the delivery volume in Africa almost doubled compared with the two previous year’s months (+46.4 per cent). Deliveries in the Asia-Pacific region fell by 10.9 per cent to 3,000 vehicles. The collapsed market in Turkey again had a major impact on the brand’s sales. With 1,800 vehicle deliveries, the volume in the Middle East almost halved (-43.4 per cent). In February, VWCV delivered 35,500 vehicles worldwide (+12.2 per cent). Of these, 23,800 vehicles were delivered to customers in Western Europe (+14.5 per cent) – over a third (9,700 vehicles) were delivered to the German domestic market.